Synopsis: Politics. Economics. Carrots. Will McLeod covers politics from around the world and Arliss does the same for economics and financial news with an emphasis on modern monetary theory. Both Will and Arliss are fond of carrots. It’s our story and we’re sticking to it: Once upon a time in a land far, far away…aka Netroots Radio, our hero, Will McLeod was a regular Monday guest on a show called The After Show, with Justice Putnam and Wink. Every week for more than a year Will delivered interesting, thoughtful, topical interviews on both US domestic and international politics. Meanwhile, just down the way, on Thursday, Arliss Bunny joined The After Show to talk about financial news and monetary policy. Eventually, Will & Arliss joined forces on Fridays to talk with Justice about whatever else was on their minds. Will and Arliss clicked. This was something of a plot twist because they come from such different perspectives. Will is a smart-as-a-whip millennial journalist and Arliss is on the tail-of-the-boomer-generation and has been in a manufacturing industry her entire working career, first in engineering/sales and later as the owner of a manufacturing business. Will is an urban kind of guy and lives in Washington, DC. Arliss is a country kind of bunny and lives in Just-to-the-Right-of-Nowhere, Indiana. Will and Arliss don’t see the world in the same way but they do share the same values – and that’s part of the magic of Hopping Mad. Will and Arliss often take different paths but they are going to the same place. On 21 September 2015, Will and Arliss launched their own show, Hopping Mad with Will McLeod & Arliss Bunny. Hopping Mad airs at 8AM on Mondays on Netroots Radio, right before Kagro in the Morning with David Waldman. Hopping Mad is also available on all manner of podcast player apps and right here on this site. It’s an adventure and you should join them as they hop on down the bunny trail. Update: 3 December 2017 – Hopping Mad is just beginning it’s third year of production and things have steadily evolved. The biggest change has been the addition of three associates. Michele LeSure handles the primary editing each week and occasionally, whenever she has a burning desire to get something off her chest, joins Will or Arliss on air. David Paquette is a registered nurse and provides deep dives into healthcare related issues among other things. Alexis’ speciality is the alt-right as well as LGBTQ conversations. Hopping Mad continues to grow and exciting new things are in the works. Stay tuned! Will writes all the time and for many publications. He has deep involvement in the politics of Scotland where he and his wife are hoping to move someday soon. Arliss originally started her blog as a test balloon to see if she wanted to start blogging on behalf of her company. She had intended to blog for one year and then make a decision. Ultimately, she decided not to blog for the company but as it turns out, the internet is the Wild West and Arliss went down the rabbit hole. Driving into Cincinnati and listening to Sam Seder’s, The Majority Report, on Stitcher radio. Sam interviewed Dr. Stephanie Kelton, an economist, and Kelton talked about something called “Modern Monetary Theory (MMT).” Arliss got curious. When she got home she started reading. Most of what was available was written for economists by economists but eventually she found a way in and buried herself in MMT publications for several days at the end of which she wrote, “Modern Monetary Theory vs the Fiscal Cliff.” That is how IT all started. Arliss continued to read and listen to MMT podcasts and YouTube posts and, basically, everything she could get her paws on. It was an immersion. 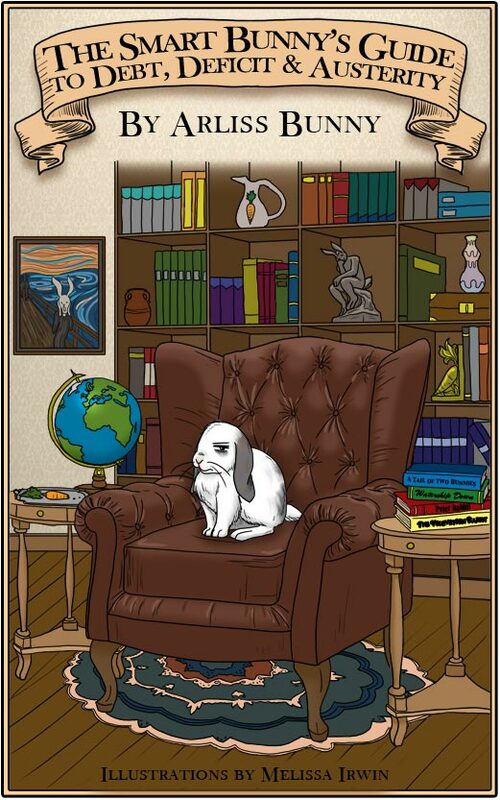 Eventually, she wrote, The Smart Bunny’s Guide to Debt, Deficit and Austerity, (which is soon to be updated to a, much revised, Second Edition) as an e-book available on Amazon. Next up were regular weekly (Thursday), and later twice weekly (plus Friday), guest spots on The After Show airing on Netroots Radio. By this time virtually all of Arliss’ public output was related to economics – and she was having a blast. Ultimately, Arliss became the Netroots Radio Monetary Policy and Financial News Burrow Chief…of course. Sometimes life really is a bowl of endive! Michele grew up in a big city and now lives in Florida. Michele and her partner share DNA with their 15 year-old son. Besides editing Hopping Mad on a weekly basis, Michele also advocates for libraries and volunteers at WGOT-LP FM 100.1 as an underwriter for programming.